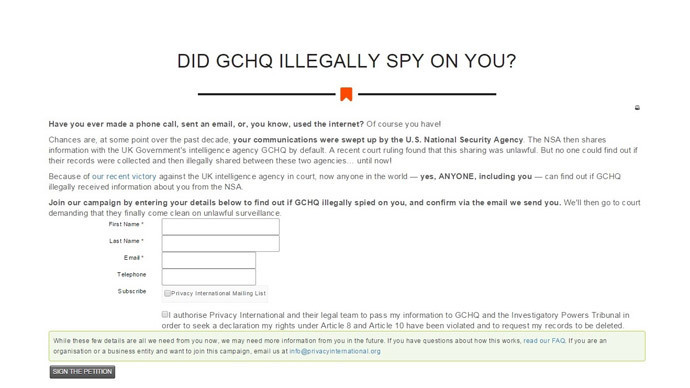 Privacy International has launched a website offering to help people discover whether British spy agency GCHQ illegally obtained their data from their US counterpart the NSA. Participants submit their name and email address to Privacy International. Their details will then be sent to GCHQ and the Investigatory Powers Tribunal (IPT) as part of a large-scale inquiry. The campaign follows a ruling by the IPT earlier this month that judged intelligence sharing between the US and UK prior to December 2014 was unlawful because the public were unaware they were being spied on. A Privacy International spokesman told RT the campaign had already struck a chord, with over 6,000 people signing up in the first 24 hours. More than 1,000 Twitter messages have used the #DidGCHQSpyOnYou hashtag as of Tuesday afternoon according to social media analysis service Hashtracking, including influential American hacker Jacob Appelbaum. Privacy International said the campaign is not limited to British citizens, but open to anyone in the world. “Given the mass surveillance capabilities of the NSA and GCHQ, and that the agencies ‘share by default’ the information they collect, an unlimited number of people could have been affected by the unlawful spying,” Privacy International said in a press statement. If participants discover they are the victim of illegal spying, they can request their records are deleted. This could apply to emails, phone records and internet communications. The group suggests email addresses alone are not enough to retrieve the information, as the databases are likely to be unindexed or organized by IP address, hardware address or under some other technical identification. Privacy International says it is only asking for email addresses at the moment in order to involve as many people as possible. If participants want to provide more information, they suggest submitting an individual complaint to the IPT. Illustrator James Walmesley, who took part in the campaign, admitted he was mostly motivated by vanity. “Other than that, I would be interested to know how the security services use the harvested information,” he added. Speaking to RT, spokesman for Privacy International Mike Rispoli said: “Over 6,000 people and counting have signed up in less than 24 hours to find out whether GCHQ illegally spied on them. This impressive demonstration of people power shows how intelligence agencies can be held to account for their unlawful activities.